During the early development of CQ/X it became apparent that driving 10-20 miles to the county line closest to the house in order to test the performance of the county detection logic was not the most efficient and safe approach. I needed an application that did not burn gas and did not require any distracted driving. So a small application was developed for recording and playing back GPS data. At first I would record the data from a GPS while driving around a course containing several county line crossings and use the recording in test runs once I was back at the house. Eventually I dispensed with the drive altogether and simply defined my test route in Google maps, downloaded the lat/lon from Google maps and had the application (SimGPS) create and playback the GPS sentences from the downloaded lat/lon values. Here is a screen shot of SimGPS. Under the Trip menu you can elect to play a pre-recorded set of GPS sentences from an actual drive or you can have SimGPS create simulated GPS sentences from a file of lat/lon values downloaded from Google maps. For a lengthy trip it is useful to define waypoints so that the trip can be started and stopped a user-specified number of miles before/after designated points along the path of the trip as indicated in the Start Playback and End Playback areas of the above dialog. Testing a planned route to anticipate how CQ/X might respond to problematic situations including, for example, cases where the highway being used travels along and actually is the county line for a certain distance. In the case of testing a planned route you would use the same lat/lon data that you downloaded from Google maps to define your route, as described on the Crossings Calculation page. In addition to SimGPS, which is included in the CQ/X download, you will need a means of performing serial communication between SimGPS and CQ/X. The most efficient way to provide this communication path is by means of a virtual serial port (VSP) pair. 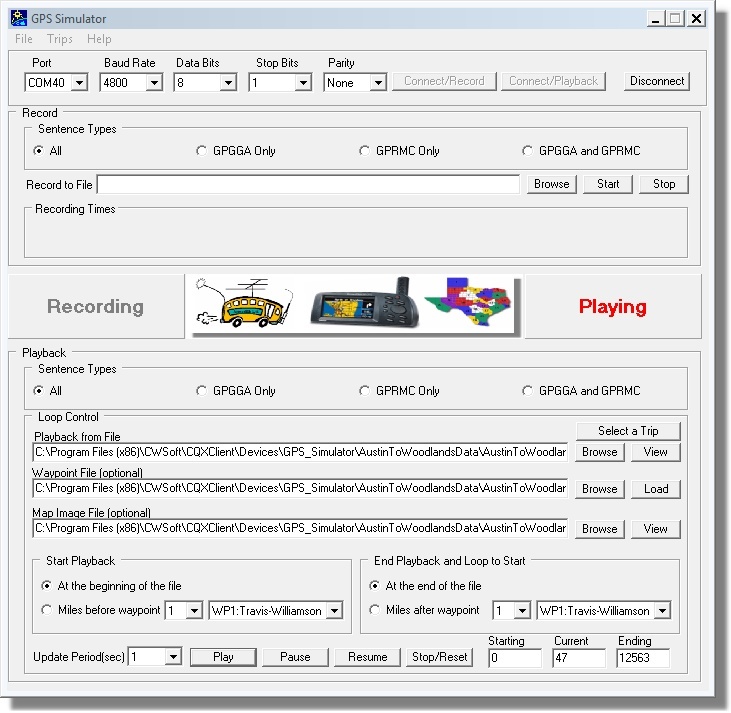 VSP software is not included in the CQ/X download but there is VSP software which is freely available for ham radio non-commercial use from several sources on the internet including VSP Manager from K5FR, which I have found to be very easy to use and reliable.